(c) 2008 All astro photo images are copyrighted. They may not be used or reproduced without explicit written permission from the authors. 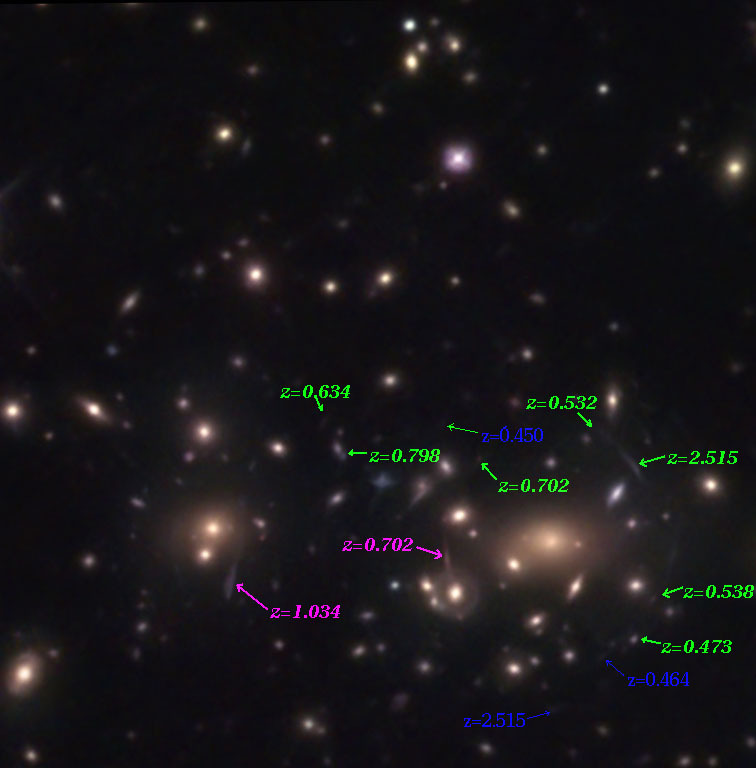 Abell 2218 is a cluster of galaxies about 2 billion light years away (z ≈ 0.18). Caused by its mass it serves as a lens for galaxies even more far away behind the cluster. 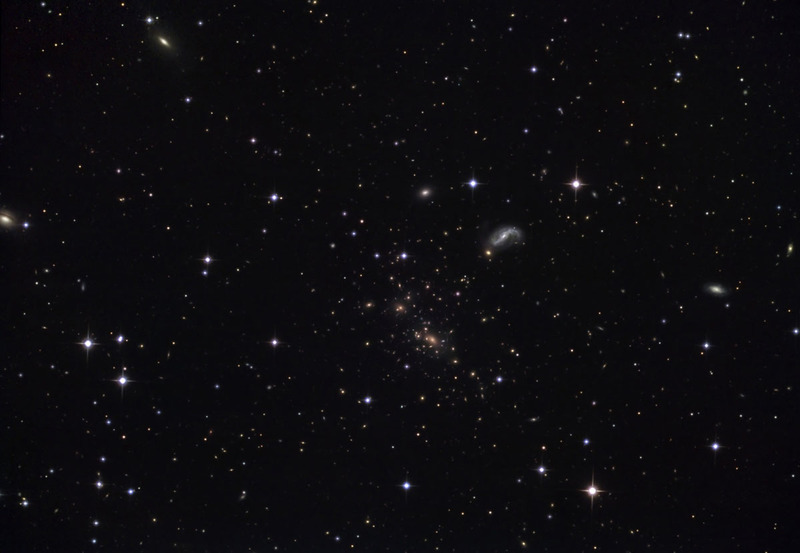 These galaxies appear as arcs in the image. 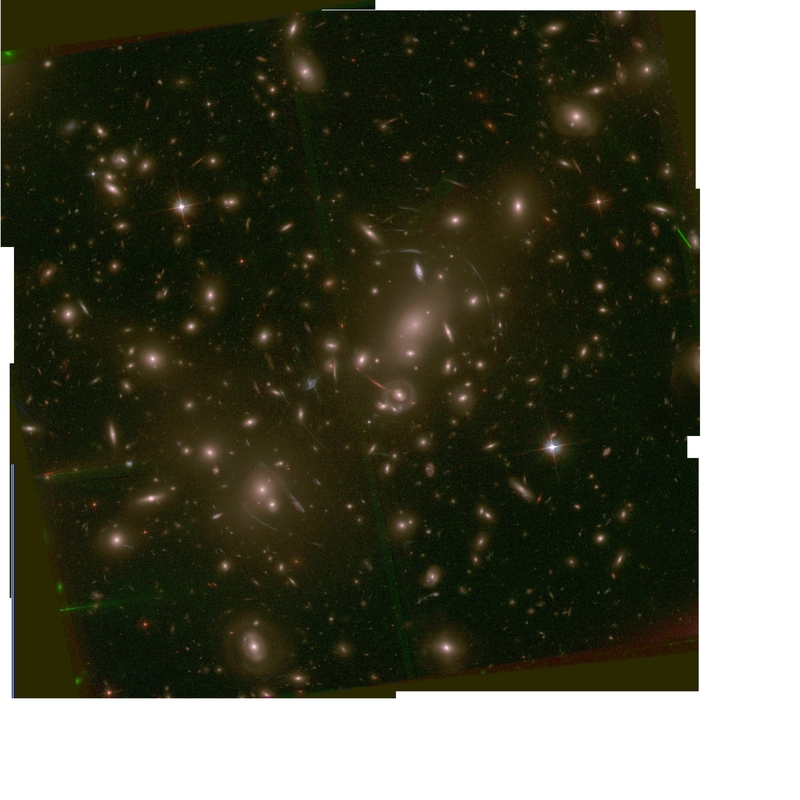 The image below shows the red shift of the lensed galaxies (see http://www.astro.caltech.edu/~rse/firstlight/).Therefore these galaxies are (and will be) the distance record holders (Z=2.515) of non point shaped galaxies on our web site. As far as we know up to now (June 2008) this image is the only color image of gravitational arcs done by amateurs. Even for the professional astronomers colored images of gravitational arcs are rare. All the more it is impressive, that large telescopes like the Keck I are capable to do spectra of these dim areas, which were used to measure the red shifts displayed below. DDP and CCDSharp (three iterations) were used. Abell 2218 ist ein Galaxienhaufen in ca. 2 Mrd. Lichtjahren Entfernung (z ≈ 0.18), der durch seine Masse als Linse für noch weiter dahinter befindliche Galaxien wirkt, die verzerrt als Bögen erscheinen. 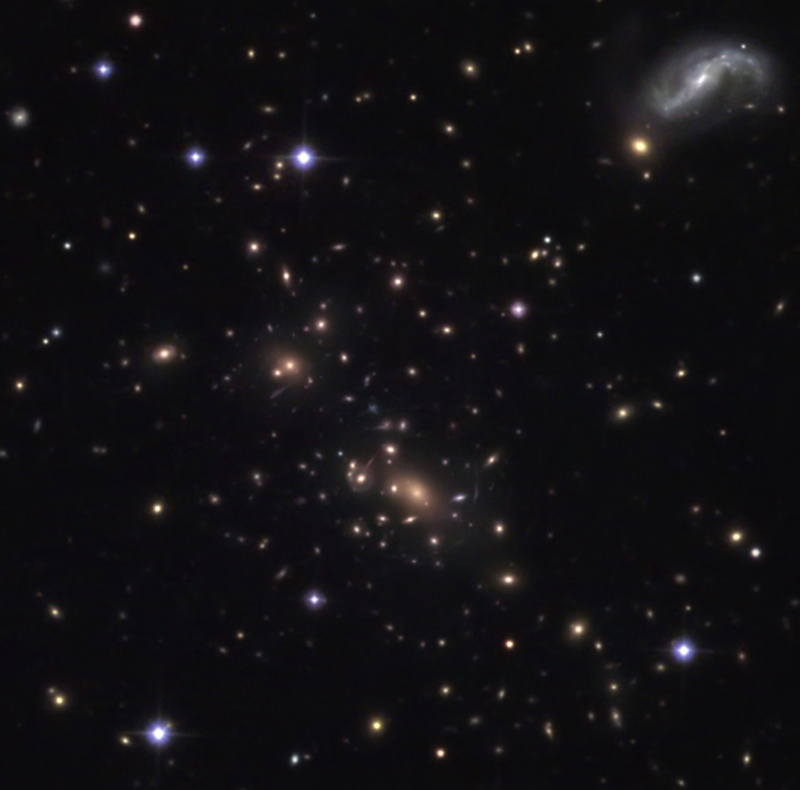 Im Bild unten sind die Rotverschiebungen der gelinsten Galaxien dargestellt (nach http://www.astro.caltech.edu/~rse/firstlight/). Damit dürften die abgebildeten Galaxien auf Dauer den Rekord als am weitesten entfernte flächenhaft abgebildete Galaxien auf dieser Web-Site halten (z=2,515). Soweit uns bekannt, ist dies bis jetzt (Stand Juni 2008) die einzige Farbaufnahme von Gravitationslinsen, die von Amateuren gemacht wurde. Selbst unter den Profi-Aufnahmen sind farbige Darstellungen von gelinsten Galaxien eher die Ausnahme. Um so beeindruckender ist es, dass es Großteleskopen wie dem Keck I gelingt, von den sehr schwachen Gebilden sogar Spektren zu erzeugen, die zur Messung der unten dargestellten Rotverschiebungen dienten. DDP und CCDSharp (drei Iterationen) wurden benutzt.